1Scholars of the Bellum Civile have often remarked that the Olympian gods are absent from the epic’s action. In contrast to Lucan’s antecedent, the Aeneid, and to the epic tradition itself, the workings of the divine apparatus here remain invisible to the readers, the characters, and our intrusive narrator alike; at no point in the poem does the will of any Olympian shape the outcome of the narrative; at no point does an Olympian god alight on earth to influence the action.1 It has been less often remarked that this absence is of fundamental concern to the narrator, who obsessively addresses the question of what their status might be; unlike the epic’s protagonists, whose views are traditional, those of the narrator are both confused and variegated. 2Accordingly, while the deorum ministeria may not shape the narrative, they are very much present in another sense through the narrator’s focalizations. Are they absent? Present, but uncaring? Unhelpful, but still listening to human prayer? We are not given to know. Sometimes the narrator opines that “mortal affairs are of no concern to any god” (“mortalia nulli / sunt curata deo”, 7, 454–5) – and then follow up such claims with complaints that they care nothing for mortal affairs; at another time he will ask Jupiter why he grants foreknowledge to human beings via omens (“cur hanc tibi, rector Olympi, / sollicitis uisum mortalibus addere curam, / noscant uenturas ut dira per omina clades?”, 2, 4–6), which suggests that the god might at least be listening to human complaints; at yet another time he will put the gods squarely on the wrong side, as with his famous contrast of Cato’s moral judgment and the divine one: “uictrix causa deis placuit sed uicta Catoni” (1, 128; cf. 4, 254–55). Some of his apostrophes assume the gods’ existence (e.g. “o faciles dare summa deos eademque tueri difficiles!”, 1, 510–11),2 others suggest they may yet intervene to prevent the outcome of the civil war (e.g. 4, 110ff., in which he asks Jupiter and Neptune to flood the fields of Ilerda) or that they yet have the power to inspire the priestess at Delphi (“magno exaestuat igne / iratum te, Phoebe, ferens”, 5, 173–4). Finally, the narrator can suggest that the gods, while existent, are weaker than other unworldly forces, such as Erictho (6, 429ff. )3 or that they only have the power to punish the weak, whom Fortune has already picked on (“Fortune guards many of the guilty, and the gods can only be angry at the weak / unlucky” (3, 447–9). In other words, the narrator variously evinces (a) the view that the gods should prevent terrible things but haven’t, possibly because they are helpless to do so; (b) the Stoic view that they do not care at all; (c) the view that they impiously side with Julius Caesar; and (d) the view that they do not exist in the first place. 4Not only the agency, but even the driving furor in this poem belongs not to an outraged goddess but to that frenzied populace. Well might the narrator ask: “quis furor, o cives, quae tanta licentia ferri?” (1, 8). 5 On Scaeva, see Behr 2007, 45ff; Fantham 1995; Gorman 2001, 263–290; Leigh 1997, chapter 5. 6 Cf. Sallust Cat. 52, 11–12. 10 On this contrast, see Behr 2007, 1–15. 11 The terminology is that of Lyne 1992. 13 On this topic, see Feeney 1991, chapter 4. 8By apostrophizing his characters in order to offer moral judgment on their actions, the Lucanian narrator seems to set up a moral framework for the action of the epic that derives from his own point of view rather than from the will of the gods or even, as in the days of the Roman republic, from the community of senators and elites. The narrator cannot rely on such public values, for that community is hopelessly morally bankrupt, and he cannot cite divine endorsement or a divine plan in a poem whose outcome is treated as a disaster for the human race (with Vergil, again, as the obvious contrast).13 If we seek a source of ethical value in this epic, the natural place to look is to these narratorial apostrophes, spoken to the characters or to us directly in a way that distances the possibility of focalization through the characters: the narrator is always too much in his own character for that, venting indignation and outrage, or an equally articulated and passionate form or support. The subtleties of “empathy” – seeing the situation through the eyes, and values, of a given addressee – are not a trait of the Lucanian, as opposed to Vergilian, narrator. And at first the values of the former seem clear: the narrator’s stance is to reverse the traditional moral terminology of the Roman upperclass by conflating antonyms; to excoriate the gods; and to lament the crime that is civil war. 9But we might suspect that this would be too simple a solution to the problem of ethics in a complicated poem – and we would be right. The problem is that the narrator, our presumably solid source of moral value, does not exercise his moral stance consistently.14 That is to say, his interventions sometimes clearly indicate that his judgment, which stands at odds with those of the gods and (often) the epic protagonists, offers us an ethical perspective to guide our own judgments: valor in battle is no valor at all; the outcome of the civil war was Rome’s destruction; the present time is synonymous with slavery. But at other times, his interventions offer a counter to this “correct” (if despairing) view, so that even the narrator cannot provide us with an Archimedean point from which to judge the world.15 We may wish to be outraged denouncers of civil war ourselves, but if so, we cannot follow him to the end. Civil war will subside and Caesar, as private citizen, will love his son in law. concidet et Caesar generum priuatus amabit. 11As Paolo Asso has noted, “By consenting to summon the abstraction of a Roman virtue, the Neronian audience is made to notice what a crucial moment this was in the war in Spain, when Caesarians and Pompeians are shown as one political body.”17 The narrator’s hatred of civil war is likewise exemplified in his apostrophe to Crastinus in book 7 at the start of battle: Crastinus is the first man to throw his weapon, which spurs the narrator to hope for his eternal suffering even after his life is over: his apostrophe to Crastinus is essentially (“di tibi non mortem…, / sed sensum post fata tuae dent, Crastine, morti”, 7, 470–471). The battle at Pharsalus is grim enough that the narrator turns to apostrophize himself, urging that this part of the war be left in darkness (“hanc fuge, mens, partem bellitenebrisque relinque”, 7, 552).18 Similarly, civil war and the slaughter of one’s peers is felt to be such a crime that his consolation to Pompey upon the latter’s defeat is that it would have been worse to win than to lose (“vincere peius erat”, 7, 706). After the battle, you should have also given us wars to fight. si dominum, Fortuna, dabas, et bella dedisses. Not in the past, and they will still favor you, Magnus. non transmissa, legent et adhuc tibi, Magne, fauebunt. 20 It is a nefas that Caesar himself is perfectly happy to indulge in: cf. 7, 259–260. 15His position is all the more dramatic if we recall that early in book one he explicitly condemned as an abomination (“nefas”) any attempt to make moral judgments about which of the two protagonists went to war more justly (“quis iustius induit arma / scire nefas”, 1, 126–127).20 By his own admission, this judgment is itself a violation of what one may say about participants in a civil war. And that valor alone would make a gift of you! sed uirtus te sola daret. 18Let us stand back for a minute to see where this discussion has led us. I have suggested that in the absence of overt divine agency the moral framework of Lucan’s epic must be looked for in the narrator. For the sake of clarity I have looked only at this narrator’s explicit apostrophes and the judgments contained therein. But within these apostrophes we cannot find a single ethical framework to be operative. On the one hand, the narrator often takes a traditional view of key moral topics, such as the role of the gods, the evil that is civil war, and the impossibility of virtus in the slaughter of citizens (note, of course, that while the view is traditional, it employs paradoxes of fact and vocabulary to make its point). On the other hand, he will also take a view that denies the gods any agency, or sees them as weak or evil; he occasionally treats the civil war as an external war (and can thus apply traditional ethical terminology to it); and now and then can he find virtus even in the very context he has denied it exists, civil war. This narrator even wishes he could join in the bygone struggle himself. 19Matthew Roller in his 1996 article on the fractured community in Lucan has made a closely related point that deserves reiteration here. Roller argues that the narrator oscillates between what he calls a “communitarian” point of view that sees the opposite side as fellow-Romans, and an “alienated” point of view that sees them simply as the enemy, and therefore worthy of defeat.21 In other words, he treats civil war as both a terrible evil, and a cause worth fighting for; and if anything, as the epic proceeds, he takes the latter view more and more often, thus coming to resemble Caesar rather than Pompey. I hope to have shown that this sort of ethical inconsistency is a feature of the narrator’s ethical stance still more broadly. 20What are we to make of this internally conflicted narrator? For one, the phrase “war more than civil” (“bella ... plus quam civilia”, 1, 1) may suggest that neither traditional values nor their inverse can do justice to writing about a war that actually exceeds civil war in involving not only fellow citizens, but actual family members. Indeed, as one of the few surviving Romans after the devastation of the civil wars, the narrator himself lives in a world without meaning, a postlapsarian universe in which consistent moral judgments are impossible. Second, the narrator’s emotional agitation and his alternation between traditional and inverted values are part of the performance of a unique and unprecedented narratorial self, and that this is itself part of the meaning of the epic. Tragic or epic characters will sometimes oscillate between two sets of values, and of course part of their predicament is that no matter which choice they make, they will suffer. Their attempt to come to a decision often takes the form of an internal dialogue. But (unlike his contemporary, Seneca) the narrator never engages in dialogue with himself about the inconsistency of the two stances that he has adopted, but remains torn and unhappy to the end. A third possibility might be to point, as others have done, at the figure of Cato, whom the narrator seems to endorse whole-heartedly and without irony or inversion despite his enmeshedness in the mire of civil war. Cato’s Stoic virtus is wholly detached from circumstance, and as such it cannot be made guilty no matter what conflict swirls around him (pace, 2, 288); moreover his God is a purely internal one and as such cannot fall prey to the vagaries of divine intervention or lack thereof (cf. 9, 564ff.). As such the narrator’s support for him escapes some of the problems that come with backing a Pompey or a Caesar. Better yet, in refusing to whole-heartedly endorse either combatant, Cato (unlike the narrator) does not commit the nefas of trying to determine “quis iustius induit arma”. uiuet, et a nullo tenebris damnabimur aeuo. 22The narrator’s longevity will equal that of the deified Julio-Claudians, but at a price: torn between intervention and abstention, ethical judgments and claims that such judgments are no longer possible, the fame of a vates and the unspeakability of his project, he comes down to us as a figure both confused and compromised by the paradoxes of his project, a poet whose final claim is that his description of Caesar will catapult him to the same immortality as the only figure whose godhead he never retracts in the course of the epic: Nero. 1 The gods’ lack of agency is in sharp contradistinction to their role in the epic tradition, e.g. the battle of wills between Jupiter and Juno that provides the structural underpinning to the Aeneid, or the active intervention of the Olympian gods in the Iliadic battle for Troy. On the absence of the traditional epic gods from the Bellum Civile, see Feeney 1991, 250–301; Hutchinson 1993, 250–55. 2 Apostrophe inherently animates and as such brings into presence what is absent. As Culler remarks, “to apostrophize is to will a state of affairs, to attempt to call it into being by asking inanimate objects to bend themselves to your desire. In these terms the function of the apostrophe would be to make the objects of the universe potentially responsive forces: forces which can be asked to act or refrain from acting” (J. D. Culler 2001, 139). 3 As Bramble notes, “The deorum ministeria of previous epic are replaced by the sympathetic reactions of an outraged cosmos, additional colour being supplied by frequent recourse to witchcraft, omens and magic” (Bramble 1982, 539). 4 See e.g. Fantham 1995 and Fantham 2003; Bartsch 1997, 50–61; in the service of a different argument Sklenár 2003, 101–51 and passim. 7 Nickau 2003, 488–499 in contrast, would have the narrator’s voice represent that of the Roman citizenry of his own time. 9 The rhetorical tradition defined apostrophe in juridical terms as speech not directed to the judges but to another real or imaginary person (Quint. Inst. 4, 1, 63.). 12 A contemporary criticism as well, if Eumolpus’ comments at Petronius Sat. 118 are to be taken as directed at Lucan. 14 Here I must take issue with one point in Francesca d’Alessandro Behr’s important treatment of Lucan’s use of apostrophe. Behr suggests that the narrator’s apostrophes show Lucan’s commitment to interpreting his narrative for his audience, and that he accordingly “enacts a kind of Stoic poetics in which ethical judgment is to the fore, and in which the reader’s detached spectatorship and sympathy is sought rather than total immersion in the narrative” (2007, 104). Her point is that Lucanian apostrophe is the specific means by which his readers might understand that the manipulation of the vocabulary of virtus, pietas, and clementia by Caesar and his supporters was to be discredited. And yet I run into two difficulties here. First, I find it odd that the passionate outbursts of the narrator should be the source of detached spectatorship on our part, and second, I hope to have shown that sometimes these passionate outbursts are not so clear-cut in their guidance to the readers. 15 In my view of Lucan’s internal inconsistency I am obviously at odds with the stance recently taken by Sklenar 2003. 18 In so doing he adopts a form usually employed by an epic’s characters (not its narrator), who will engage in discourse with their own organs of feeling or thought. We might recall Odysseus’ self-address to his heart at Odyssey 20, 9–30, when he bids his heart to endure these evils as it has others before. 21 As Roller 1996 shows, the narrator himself seems to adopt a more and more alienated point of view, in contrast to Pompey, who usually sees the opposing side as consisting of fellow Romans and is accordingly reluctant to go to battle against them. Pompey constantly worries and delays; in book 2, 550 he says that he dislikes the fact that he has to fight Caesar, and his delay before joining battle at Pharsalia spurs an impatient Cicero to rebuke him into action. Caesar, on the other hand, tells his soldiers in book 7 that they are not fighting Romans but foreigners. He also enjoins upon his men to mangle the faces of the enemy, even if or especially if the enemy consists of their brothers and fathers. Accordingly, Roller argues, because the narrator treats Caesar as the enemy and wants to take up arms against him, because he is so keen for the Pompeians to win at all costs, he paradoxically resembles not the hesitant and ineffective Pompey but Caesar himself, who hungers to defeat the enemy. One might even say that he himself is becoming dangerously close to a narrator for whom the war is no longer civil, but foreign. 22 On the terminology of fas and nefas to describe the “speak-ability” of civil war, see Higgins 1988, 208–226. BARTSCH, Shadi. Ethical Judgment and Narratorial Apostrophe in Lucan’s Bellum Civile In : Götter und menschliche Willensfreiheit : Von Lucan bis Silius Italicus [en ligne]. München : C.H.Beck, 2012 (généré le 20 avril 2019). Disponible sur Internet : <http://books.openedition.org/chbeck/1439>. ISBN : 9782821846326. DOI : 10.4000/books.chbeck.1439. Bartsch, Shadi. “Ethical Judgment and Narratorial Apostrophe in Lucan’s Bellum Civile”. Baier, Thomas. 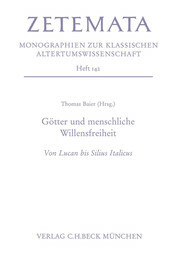 Götter und menschliche Willensfreiheit : Von Lucan bis Silius Italicus. München : C.H.Beck, 2012. (pp. 87-97) Web. <http://books.openedition.org/chbeck/1439>. BAIER, Thomas (dir.). Götter und menschliche Willensfreiheit : Von Lucan bis Silius Italicus. Nouvelle édition [en ligne]. München : C.H.Beck, 2012 (généré le 20 avril 2019). Disponible sur Internet : <http://books.openedition.org/chbeck/1422>. ISBN : 9782821846326. DOI : 10.4000/books.chbeck.1422. Baier, Thomas, ed. Götter und menschliche Willensfreiheit : Von Lucan bis Silius Italicus. München : C.H.Beck, 2012. Web. <http://books.openedition.org/chbeck/1422>.